Our first show in London! I THINK the timestamp is correct-April of 2001. Man, oh, man. I remember talking with one of our managers at the time who had worked and lived in London for a very long time previous to our working together. He always mentioned we would do well there and he could get us going there very easily. I said, well ok then let's go. He set up the show, we put in our money, packed our bags and had our first show in Camden. There were quite a few record labels there to see us and we were so ready to play and share, regardless of the outcome. We did get a record deal after that which allowed us to continue doing music for a living. We were signed with BMG UK and "the rest of the world" except for the USA which was MCA/Universal. I always thought that wording was funny. It sounded absolutely crazy-THE REST OF THE WORLD. I will say though, I still check my ASCAP statements to find that our songs are still being played on tv shows in Finland and Greece. I've never physically been to either of those places, but my music has. Wacky. p.s. Nicole Kidman came to that Camden show. She was very friendly and complimentary. I remember so clearly that her hands were so small and delicate when I shook them. I felt like I would break her with my Montana strength. It was in the tabloids the next day that she had to come to the show. It said she "whisked away in the rainy night wearing a white trenchcoat" (rainy yes, white trench no) and that she went to see the band Venus Fly! HA!! Love it. 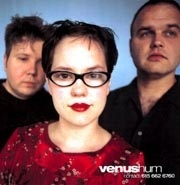 Venus Fly. We totally should have went with that. CLOTHES NOTE: That dress was a glorious 50's number that had a filmy light chiffon overlay. Eventually my husband would put it in the washer (or dryer?) and it would turn out to be an even MORE glorious dress due to some perfectly placed rips and stitches. My ring is from the Pylones in London. Two Polish brothers made jewelry that they would put a piece of art on and then cover with a bubble of glass. They only made one set of each design. I loved that ring. I still wear this dress. 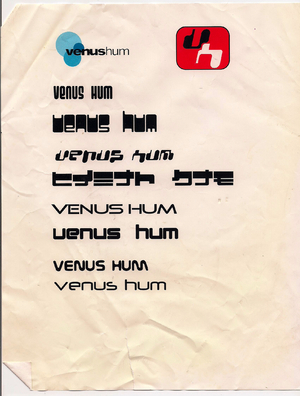 Venus Hum and Mono-Fi.... nice names but how will they look on a T-Shirt? We had a name but no real identity as far what that name would look like on an album cover or T-Shirt. Here's the choices given to us be logo/graphic designer Jill Earl who also took care of all our early posters and merch. We went with the top left and that was later animated by Chris Lee our live projection artist. I know we all didn't like trendy computer or sci-fi fonts so the choice was fairly easy...even for three people. Here's the final logo for Mono-Fi. I don't remember who came up with "full color sound"...but I stil like it. These two patches created for songs on Venus Hum are my gift to whoever wants to make and use them. I have no secrets when it come to sound design... you can have any pach digram to any sound I've ever made..just name the patch afer me. in the year 2000 we opened for Stereolab who were touring after the release of their album 'Cobra and Phases Group Play Voltage in the Milky Night'. I'm one of the biggest Stereolab fans in the word so this was a big deal for me. The venue was 328 Performance Hall in Nashville, the place where we played our first ever gig. But this was different- our first gig was part of a festival, but this show brought out many diehard Stereolab fans from in and around Nashville. There was some overlap with our local fans, but there were also hundreds in the audience who had no idea who we were. I tried to suppress my mega-fan nervesess and didn't bother Stereolab with too many geeky questions about their studio process, songwriting ,etc. Our good friend and sound-man for the night (Marc Chevalier) was equally cool, until after the gig (and a few drinks!) he finally said screw it- and we both launched a full nerd attack. Tim and Laetitia (Stereolab's primary members) where so sweet that they indulged us. The gig went great. We had gained a decent local following in Nashville at this point, but it was good to have to win over such a big audience of newbies. The highlight of the night was when Stereolab took the stage and the first words Laetitia said 'Well, there's some tough competition here tonight.' Nice! This was an important gig for us, also, because there were some record company folks in to see us play. Most notably A&R man, David Field had flown in from LA. David would later move back to his native UK and eventually sign us to BMG. London - as we found it. While we were trying to break in the UK we all stayed in London...our postal code was NW3. I made this video ages ago trying to learn iMovie. It's a simple film about our first neighborhood in London. Some of the iconic images to me are the Marathon Chip shop, Camden Tube stop and Loch, and the Camden Barfly where we had our firsr ever London show- the show Nicole Kidman came to see us play. I found this pic today- it's our first ever press photo. We all looked so much younger then.